Rughooking has been chosen as a medium by female fine artists for decades. In honor of Women’s History Month here are some examples. Marguerite Zorach (1887-1968) born and educated in California, lived in Maine, New York City married to artist William and mother to Dahlov Ipcar an artist in her own right. 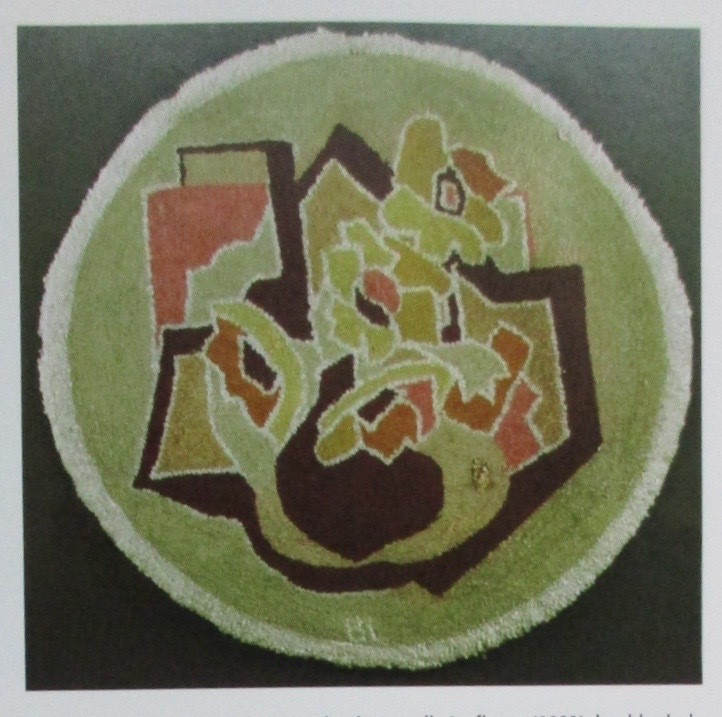 Marguerite explored the same subject in different mediums as Blanche using the time consuming techniques of embroidery and rughooking purposefully to promote women’s handcraft to an audience of art viewers. 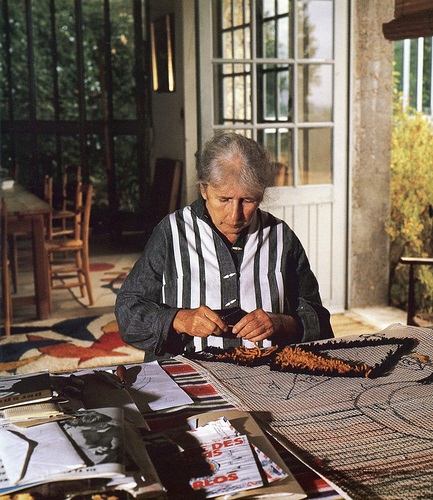 Her designs were not authorized as patterns, yet have been copied from illustrations in books about antique hooked rugs. West Virginian Blanche Lazzell (1878-1956), active in printmaking, painting and decorative arts developed some of the first abstract work in American art in the teens of the 1900’s. She said of her work in textile and pottery it “helps us to do the next thing better”. A woodblock would be interpreted as a painting and again by hooking a rug, each time the design revealed something different to the artist. 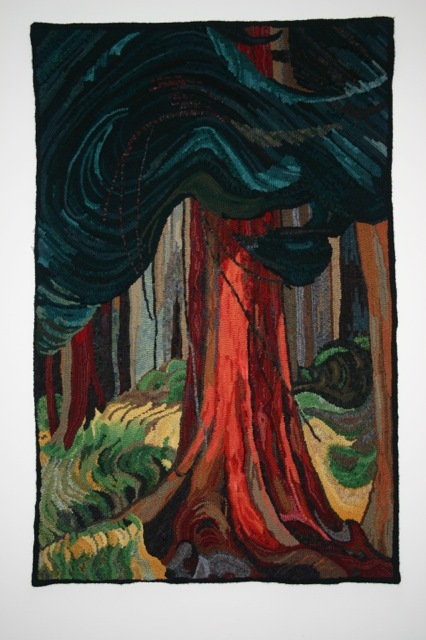 She contributed five designs to Ralph Pearson’s project “Contemporary American Artists’ Hand-Hooked Rugs” along with fourteen other modernist artists in 1927. Emily Carr (1871-1945) from British Columbia, a Canadian national treasure, as author, painter and during a period when extra income was needed, rughooker. An independent spirit she explored and documented the First Nations villages along the coast above Vancouver. Her talent was acknowledged late in life, when invited to participate in major exhibits in Ontario alongside the Group of Seven’s work. The hooked designs incorporate the native designs rather than interpreting her painterly natural subjects. Today several paintings are licensed as patterns and hooked renditions convey her brush strokes. Visit the Carr House, her family home in Victoria. Louisa Calder (1905-1996) interpreted her husband Alexander’s artwork in hooked rugs using yarn and a latch hook as depicted in ‘Calder’s Universe’ a catalog accompanying the retrospective in 1976 at the Whitney Museum in New York City. Calder worked on or authorized several textile projects and many of his work was also hooked without permission by the public (disregarding or prior to copyright laws). See this link for a listing of textiles.not all created equal. 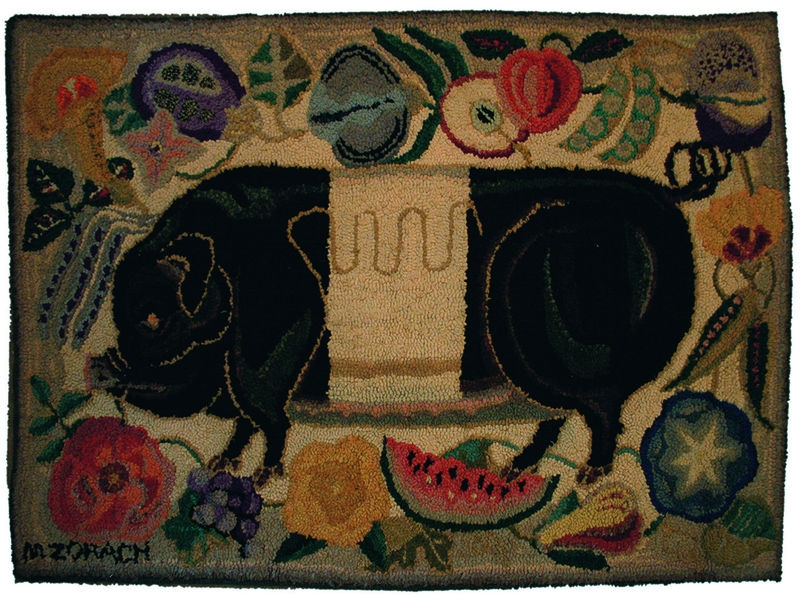 This entry was posted in elements and design in art, Fiber Musings, hooked rugs, textile art, West Virginia Artists and tagged Blanche Lazzell, Emily Carr, fiber artists, hooked rugs, Louisa Calder, Marguerite Zorach, rug hooking, west virginia on March 2, 2018 by Susan L. Feller.